The 5 Step Plan To Budgeting and Getting Out of Debt for Beginners | Save. Spend. Splurge. I too was once a beginner and now net worth growth has been pretty great. Here’s my simple 5-step plan. STEP ONE – WHAT DO YOU MAKE? To find this, look at your pay stub or look at your bank account and look at how much gets deposited into your bank account each month. Net means any amount after taxes. Note: This is assuming you’re an employee collecting a paycheque, so if you’re a freelancer, be sure to record the NET amount (after expected taxes). 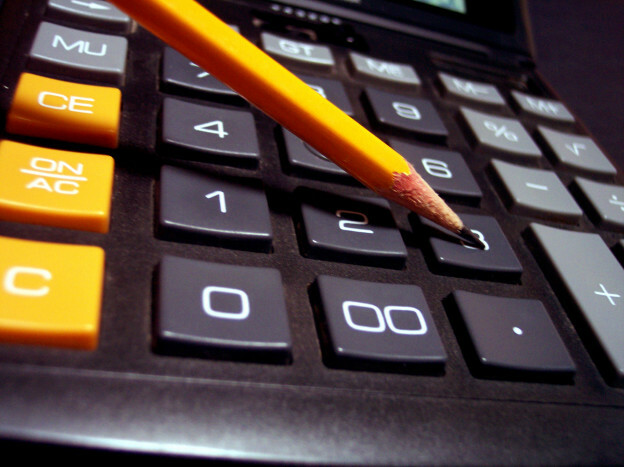 Of course, make sure it is a monthly income amount you are using to budget. If you receive an amount weekly, multiply it by 4. If you receive an amount bi-weekly, multiply it by 2. STEP TWO – WHAT DO YOU OWE? If you have debt, then go through all your line of credit, mortgage and credit card statements. To get the information you need, you need to gather as many bills as you have to get an idea of what you need to pay, especially for things like utilities, mortgage/rent or insurance. It doesn’t have to be pretty, but it has to balance to $0 based on your income coming in. If it doesn’t balance to $0, it means you don’t make enough money or you need to cut back somewhere until it balances to $0. Additionally, if you have debt you need to also account for the fact that you need to pay it down. 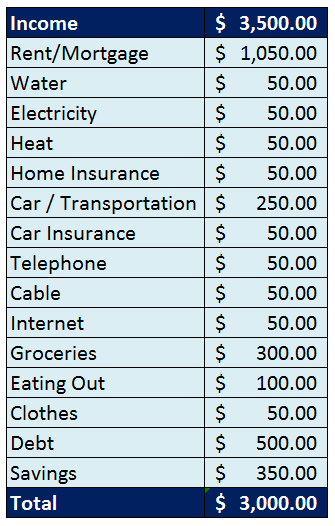 Adjust the categories and split them out into sub-categories as required, but make sure it all balances to $0 at the end. Now comes the hard part. Track your expenses for the first month. Write down every single amount you spend on anything that you buy or have to pay as a bill, and put the date beside it. You HAVE to keep up on this and be diligent, otherwise you will not know where your money is going. It doesn’t have to be complicated or elaborate, it just needs to be done. ..or you can use an automated spreadsheet tracking tool like The Budgeting Tool (all net proceeds go to charity) or whatever you decide works best for you. You can also decide to add other (optional) things in there to track like what store you go to, comments and what you used to pay (Credit Card, Cash, etc) if you want a little more detail but don’t overthink it. So take what you spent for the month from Step 4 and compare it against your Budget from Step 3. Does what you spent, match what you set up as a budget? Did you underspend in some areas? Overspend? Forget categories (e.g. Taxes or Grooming)? This is where an Excel spreadsheet or automated budgeting tool may come in handy but a pen, calculator and piece of paper does the job just as well with a little more time and work. It may end up looking something like this and it may be even uglier than this. Do not feel bad if this is the case. My first budget was bleeding because I was WAY over budget in many areas). Take that information and go back to your budget to revise it. 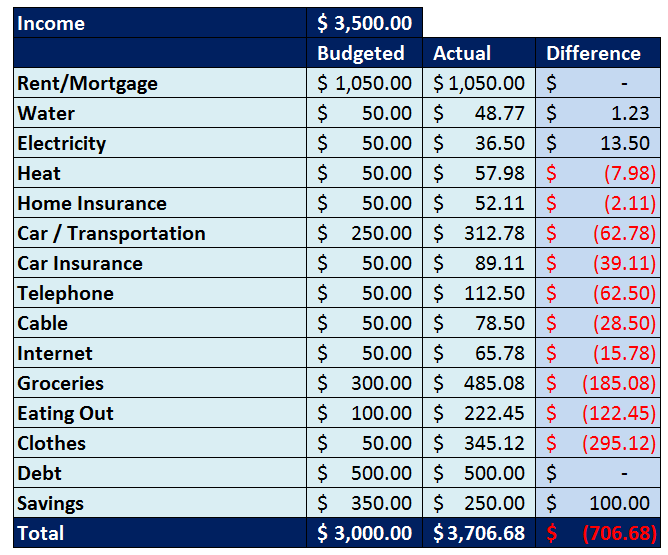 Fix the amounts you are allocating in your budget to be more realistic. Realize where you could do better (give yourself a break, this is your first crack at it after all). Now you’re budgeting, and quite autonomously I might add. Keep repeating steps 4 and 5 again until you get a budget that balances to $0 and works for you. It may be a short, or a very long process. It took me a good year before I really got the hang of it, but I saw IMMEDIATE results once I started budgeting and tweaked my budget down to the penny but you can do it in 3 months or less, guaranteed! There are very few expenses that are ìfixedî which include things like Rent, Car Insurance, Home Insurance and Daycare bills for instance. The rest, are all variable. You can control how much you go out to eat, buy in groceries, or spend on ìLifeî. At some point you are going to plateau and reach a groove. You may be fine with staying in said groove, or if you want to add a little more excitement, you may want to find a way to push yourself harder or maybe it is just getting too hard to try and make ends meet with what you are doing so far. If you want to improve on your savings or debt repayment but find that you are hitting a wall, or a dead end where your budget NEVER balances because you simply have too many essential expenses (healthcare or daycare are big killers of budgets here), and you have no choice but to pay them. If this is the case, then instead of trying to squeeze blood out of a stone from eating less (groceries) and depriving yourself from having fun, you have two options at this point. The first one can be easy to a certain extent. 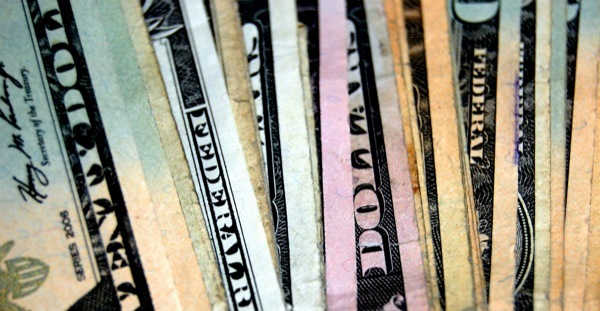 You can cut fixed bills like your cellphone, telephone, internet and cable and those are easy wins. Switch to a lower-cost carrier. Reduce your plan and try to use your cellphone minutes sparingly and only for emergencies (this is what we do). You can also (maybe) like us, cut out cable TV altogether and just have a Netflix subscription or Hulu and watch your episodes online. There are plenty of creative ways to cut your budget down, but you have to be willing to do them. The harder cuts are if your rent is really too high and you need to move. Or you have come to the conclusion that you need to sell your house. These are not easy or quick decisions to make or even to carry out, and before you reach those levels, consider the second option: making more money. Pick up a part-time job, find a better job, ask for a promotion at work if you deserve it, work more overtime, sell your stuff on eBay, offer your services, maybe babysit, or clean housesÖ and charge for your work. Everything may be falling in place and be perfect for the first 6 months, even to a year, but if your debt plan is not aggressive enough, you may hit what we call ìdebt fatigueî, where you are tired of living like a monk compared to the way you used to live, and you don’t see things getting better any time soon. In fact, it happened to me quite a number of times. Very few people can do this. They are the types of folks who make their own soap, dumpster dive, and know how to stretch that penny until it squeals. They are the ultimate Frugalites of the Frugalsphere and they are few and far between. All the more power to them if they can live on $100 a month but I am admittedly not one of their tribe. Although I will say that near the end of my debt-clearing process about 16 months in, I was doing things like wearing belts around pants that were too big on me just to avoid buying new pants in a more fitted size. Once I got out of debt, it has been a complete 180 for me and I can’t seem to go back to spending as little as possible the way I used to. I got used to the good life also known as ìlifestyle inflationî. Anyway, my point is that do not tell yourself you will not eat out or buy clothes for the next 5 years because it is NOT REALISTIC. The plan is to actually get you out of debt, not to just talk about it, have you build a plan and then fail miserably and go back to your old ways feeling like you’re hopeless. 2. Make sure you can clear your debt (not including your mortgage) in 5 years or less. This is the maximum time of debt repayment most folks can take. 5 years is a long, terrible, arduous time to live with debt chained around your neck. The only way to expedite the process is to make more money or cut back and throw as much money as you can into getting rid of that debt. To put it bluntly, the sooner you clear your debt, the less you will pay in interest to the banks, and the quicker you’ll be free. Ö. Just remember what it will cost you to get there, be it your emotional or mental sanity, and if you cannot live like a monk with an overly ambitious debt repayment plan for 5 years, then you are just setting yourself up for failure. If you are a shopping aficionado like myself, you will need to find other ways to keep busy and to not spend money and to NOT BE TEMPTED. They haven’t all worked as a foolproof plan all the time, but the less I see, and the less I am tempted with, the less I spend. ← Style Bloggers <3 Budgeting: Sherry of Save. Spend. Splurge. Budgeting is my one and only resolution this year! I’m doing a zero based budget this month and so far it’s going well. We’re not in debt, but my husbands making a career change and so I’m just using my net income. We’re already pretty frugal so its going to be interesting…I’m going to be blogging about it to keep me accountable. My blog has definitely helped me establish and maintain habits. I just heard your interview on So Money and had to come visit. Thanks for the encouragement! It’s time to put head knowledge into action! I should take note of your blog because I am NOT frugal but I am good at making money which is not bad, one out of two.. I agree with everything here too. 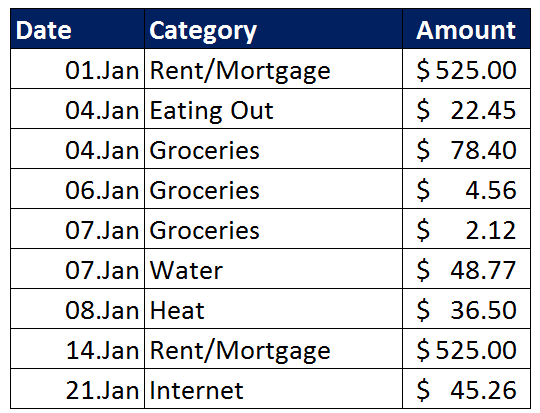 Once I create a budget, I love to break it down by percentages (e.g., 40% of my income is going to mortgage/rent), I use this as an indicator to determine whether it is too high. This really helped me with my dining out/entertainment budget. Compared to what I was earning at the time, I had it WAY too high. I like just knowing what I spend all my money on. You’re my favorite enabler :). For a moment yesterday, you had me thinking I need a linen dress with pockets! Then I talked myself out of it by remembering what drycleaning bills look like. Seriously though, I agree with everything here especially step 3. Once your mind is trained to spend, you have to be very deliberate in untraining it.